On the morning of the ninth anniversary of the death of Father Ray Brennan, 16th August, the students, teachers and volunteers from the Vocational School for People with Disabilities gathered in honour of Father Ray to make merit by donating alms to local Buddhist monks. Twelve hours later a catholic Memorial Mass was attended by all the children and students living at the Father Ray Foundation, as well as many locals, both Thai and foreign. Foreign volunteers make merit on Father Ray Day. After the Mass almost one thousand children, students, teachers, volunteers and supporters paraded along Pattaya Central Road and Sukhumvit Road to the final resting place of Father Ray in the cemetery at St. Nikolaus Church. Once at the cemetery rose petals were sprinkled on the grave of Father Ray while the students from the School for the Blind sang the song ‘Unsung Hero’, which was written in honour of Father Ray. 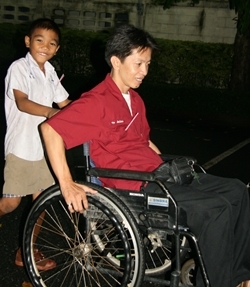 The majority of the children and students with disabilities who are now living at the Father Ray Foundation never met Father Ray, many were not even born when he died, but they all know about him, they know what he did and they are grateful to him for giving them a chance of a better life. Students of the Father Ray Foundation join the monks in prayer. 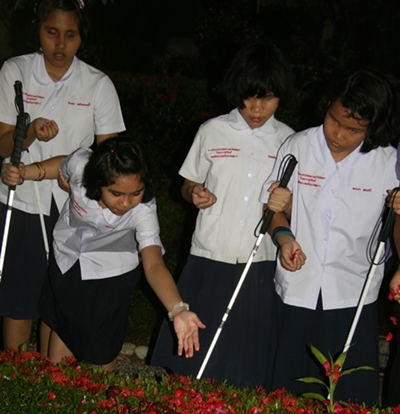 The blind students sprinkle rose petals on Father Ray’s final resting place. The candlelight ceremony travelled along Pattaya Klang and Sukhumvit Road.